→Why Should We Remember What Happened on the 21st of September, 1972? Why Should We Remember What Happened on the 21st of September, 1972? It has always been part of our nature as humans to document our milestones, even way before paper and ink was invented. And for every event, most often there is a corresponding date that is recorded. From the cave etchings up to now, we have always felt the need to tell our story. It’s not just an ordinary story, we have been creating and recording our history through time. Through history, we understand ourselves more – we look back at how things came to be and what brought us to where we are now. And as we write down history, it is important to put everything down. There should be no sort of sugarcoating involved. Because when this happens, our real history is changed. We forget through time, we will no longer remember. We accept what has been presented as the truth. We should understand that we are where we are now because of the sum of the good and bad events that has happened in the past. Whether it’s a good or bad event, we should take a good look at it because it is our REAL history. We can’t deny that some things happened just because it’s painful or embarrassing. It is the truth and we must not deny its existence. Unspeakable or not, history is history and we should face it as it is. It’s part of our identity. It is also a disservice to the people who have brought us to where we are today. Let us give honor where it is due, heroism that should not be forgotten. That’s why we should not forget about what happened on the 21st of September, 1972. It was a dark time in the Philippines, but it should definitely not be forgotten. Actually, it was postdated because of the superstitions and numerology beliefs by the then-president, Ferdinand Marcos. 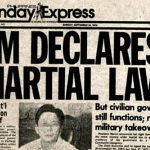 Marcos, that time, claimed that the Philippines was in a state of unrest that he felt it was necessary to declare the country in a state of Martial Law. For those who are not familiar what Martial Law is, it is declared in areas (that time it was the whole country) where there is civil unrest or ravaged by major natural disasters. To control the situation, the government may use measures such as curfews, suspensions of civil laws, rights and habeas corpus. Those who defy the measures are subjected to military tribunal. And so the government in 1972 placed the Philippines under such measures and it went way beyond. Sadly, the Martial Law went beyond time and abuse. Freedom was curtailed and it was reduced as an excuse for detaining anyone who is critical to the government. Where freedom stopped, reports of illegal detention, torture, abuse, and even murder increased. 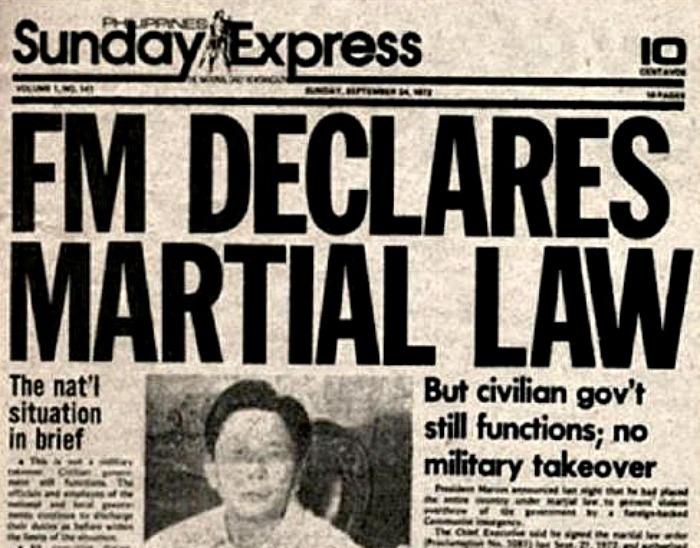 The Martial Law was “intended” to protect the country and its people. However, it just increased the power of those in position. Power over the powerless. Years have passed by from 1972, and some people have tried to justify what happened. That’s an abomination to say the least. It is indeed a painful past but lives and human dignity were sacrificed and we must never, ever forget that. Ellen-Rae Cachola, “The Haunting of Martial Law: Records from the Marcos Regime,” http://library.law.hawaii.edu/2017/09/07/the-haunting-of-martial-law-records-from-the-marcos-regime/, (September 7, 2017).